LOS ANGELES - June 28, 2016 - PRLog -- The United Premier Soccer League (www.upslsoccer.com) showcased the 2016 Winter Season Championship Match with the San Pedro Monsters of the UPSL Western Conference battling the Strikers FC South Coast of the UPSL South East Conference. The Strikers South Coast emerged as the Champion with a convincing 3-1 victory to win the 2016 UPSL Championship trophy. 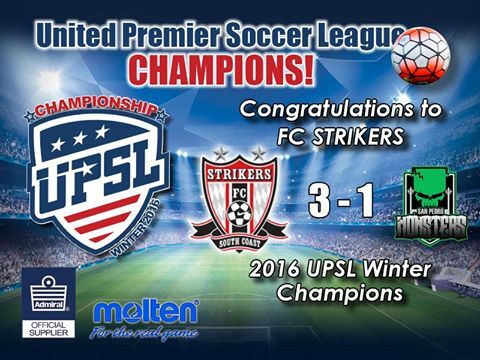 UPSL Commissioner Yan Skwara stated, "The UPSL is excited to name the FC Strikers as our new 2016 UPSL Champion for our 2016 Winter/Spring Season. We congratulate the Strikers on a tremendous season as the Strikers battled hard to beat out the San Pedro Monsters on Saturday night 3-1 in a very exciting back and forth match. We had a nice crowd on hand at Banning High School that was treated to a quality Championship level match. This classic UPSL Championship matchup is a testament that UPSL continues to grow and showcase the top Pro Development teams and players in the Western United States as the level of play was impressive which is what we want to see as a Premier Pro Development league. We look forward to kicking off our 2016 Summer / Fall Season on July 16th as we have an array of new teams coming into the league which includes our three Conferences in California, Nevada and Arizona. The (UPSL) United Premier Soccer League was formed in 2011. The UPSL currently operates 40 plus teams all based in California, Nevada, Arizona and Idaho with 60 plus teams targeted for 2017 Winter campaign. With the addition of new clubs, the United Premier Soccer League is the fastest growing Pro Development League in the USA. Each UPSL team is individually owned and operated, and is responsible for maintaining UPSL minimum standards.